Yannis Leonardos at Marine Marketing in Greece gets in touch with news of a €1 million price cut on the 42m motor yacht Panther 2. Built in aluminium in 2008 by Mondo Marine to a design by Studio Vafiadis, Panther 2 accommodates as many as 14 guests in a master suite, VIP stateroom, two doubles and two twins, each with a Pullman berth. Twin 2285hp MTU engines power her to a maximum speed of 21 knots. 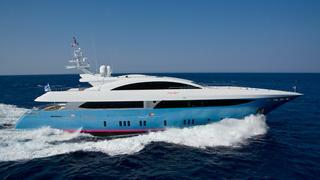 Lying in Athens, Panther 2 is now asking €7.95 million.